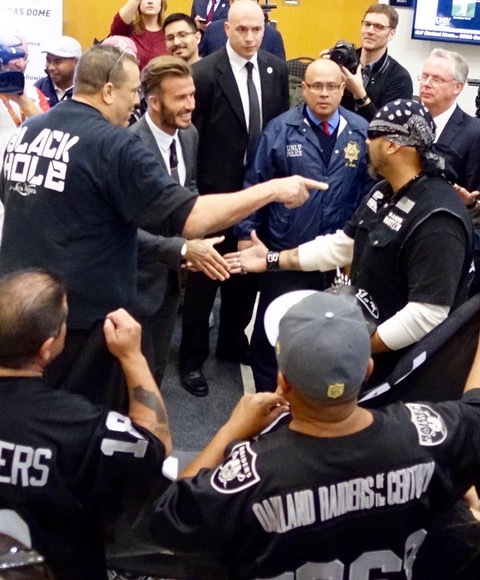 (Caption: RAIDERS FANS SWARMING SOCCER LEGEND DAVID BECKHAM AT A MEETING TO DISCUSS THE RAIDERS' STADIUM IN APRIL, 2016.) Photo: Norm Clarke. David Humm died a happy man, knowing the team he loved and took care of him to the end, was moving to his hometown.The former Nebraska star and Oakland Raiders backup died at his Las Vegas home Tuesday, almost a year to the day the 31 of the 32 NFL owners agreed to the Raiders’ request to relocate the storied franchise to Las Vegas. “I think we’re going to be the best thing to happen to his city, after gaming,” Humm told me that day. He died six days shy of his 66th birthday. He was diagnosed with multiple sclerosis 30 years ago and spent the last 20 in a wheelchair. Starting with Al Davis and carried on by his son, Raiders’ owner Mark Davis, Humm was treated like a member of the family.When Al Davis came to Las Vegas to celebrate his Fourth of July birthday with a bash that included ex-Raiders, he never forgot to invite Humm. On one occasion, Al Davis picked Humm up and, while driving around Las Vegas in a limo, revealed a long-held dream. “He would have loved to have moved the Raiders here. He told me that many times,” Humm told me in 2014, for a July 4th column on what would have been Davis’ 85th birthday. Davis died Oct. 8, 2011. Davis held his birthday parties at Piero’s Italian Cuisine for years. The itinerary strictly followed “the same game-day schedule as if it were a regular Sunday,” Humm recalled. “And after the last player spoke, you could hear a pin fall on the carpet,” said Humm. He played for the Raiders from 1975 to 1979 and 1983 and 1984, most of it as a backup to Hall of Famer Kenny Stabler. The Raiders’ fifth round pick in 1975, he was cut three times and re-signed three times. The highly recruited Bishop Gorman star played on two Super Bowl teams (1976 and 1983) won by the Raiders, and led Nebraska to three bowl game victories, the Orange, Cotton and Sugar Bowls, one under Bob Devaney and two under Tom Osborne. He was a backup on Nebraska’s 1971 national championship team behind Jerry Tagge. When he lost his ability to walk in 1997, the Raiders set up a broadcasting studio in his home so he could work as a color commentator. The Raiders kept him on the payroll throughout his struggles with MS. As of a year ago, he was still selling their luxury suites and doing a weekly show with former Raiders safety George Atkinson. One of his most coveted momentos was a replica of a Super Bowl trophy given to him by Al Davis, Humm said. “Al was totally enamored with Sheldon Adelson and Steve Wynn. We’d go to lunch in one of their new hotels and he would rave about the vision of ‘these brilliant guys,’” said Humm. He lived long enough to see Al Davis’ vision of the Raiders come true. My last question: why don’t you have an unpublished telephone number? “I learned that from Bob Devaney,” he said. "He and all of his coaches had their numbers listed in the phone book. I’ve been unlisted my whole life. I’m just an old backup quarterback." With that, Humm apologized and said he had to end the conversation. DRIVEN FROM HIS LAS VEGAS EMPIRE, WHERE WILL WYNN LAND NEXT?